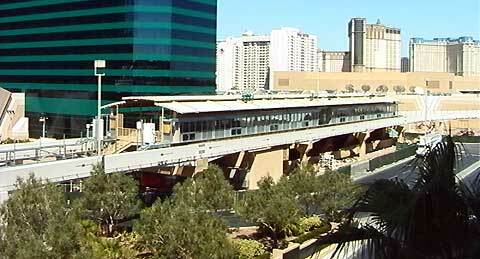 Construction Gallery - Las Vegas, Nevada. Thanks to Karl for the following end-to-end look at the stations. As we have before, we'll follow the guideway from one end to the other, but this time we'll focus mostly on the nearly-completed stations. At the south end of the 4-mile monorail is the new switch back platform. 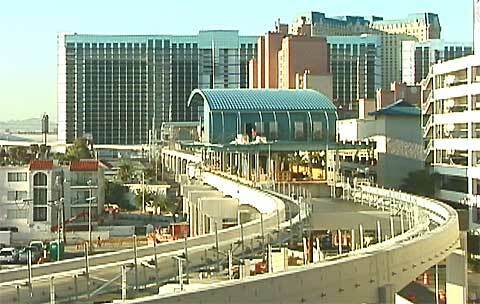 The MGM Station now has walls for the automated door system that every station will have. The track to the left is new, it leads to the switch back platform. 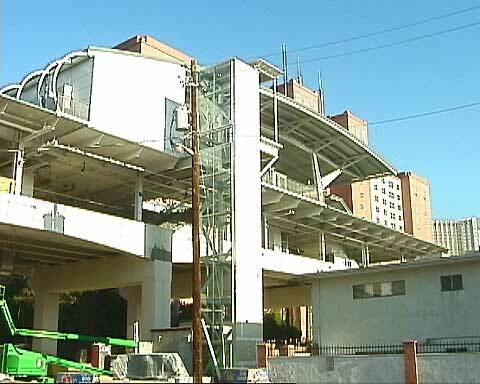 The Bally's Station is also undergoing a major transformation with the addition of automated doors and a new elevator. 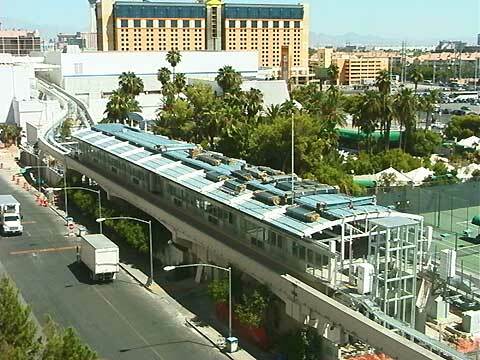 The new track starts at the far end of the station and it slices through part of the Bally's Resort building. 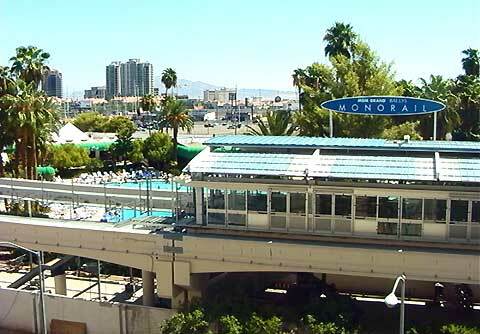 Bally's Station affords a nice view of their pool. It's brand new, but the Flamingo Hilton Station is already surrounded by palm trees and greenery. Flamingo Hilton Station is one of two that are squeezed into an alley behind the Strip hotel corridor. 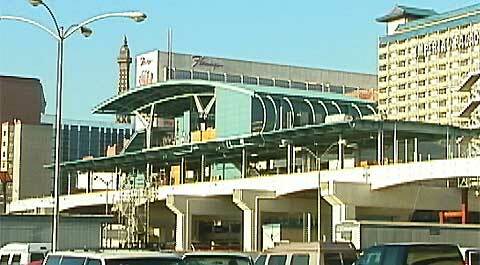 A tiny bit to the north is the Harrah's/Imperial Palace Station. 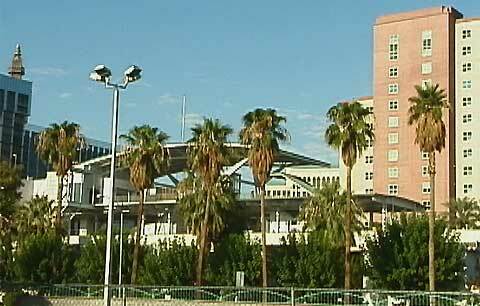 Harrah's/Imperial Palace with the Flamingo Hilton Station in the distance. 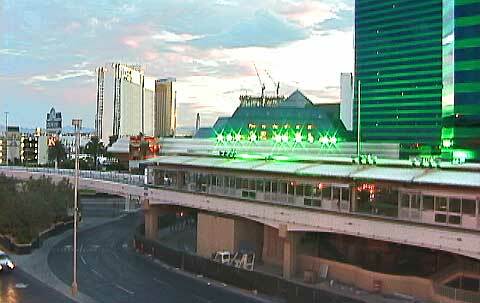 The silvery building in the background is Bally's. Click here to see the rest of the stations in Part Two of Karl's latest photo shoot. April May, 2002, tall columns. May 3, 2002, beam manufacturing continues. 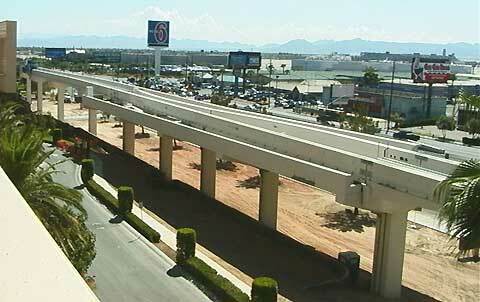 March 26, 2002, first dual-guideway beams up. March 22-24, 2002, first look at t-supports. January 16-17, 2002, first beam lifted into place. January 2-3, 2002, columns and rebar. December 2001 beam yard images. October 2001 first pylons and track.